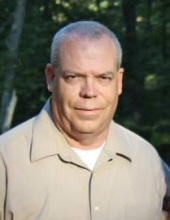 Roger Dale Brown, 56, of Crab Orchard passed away on Tuesday evening at the Ephraim McDowell Hospital in Danville. He was the husband of Lisa Gail Gauntt Brown whom he married on September 15, 1984. Roger was born on August 23, 1962 in Cincinnati, Ohio. He was the son of Hazel (Todd) Brown and the late Carl Brown. He was a former employee of the Trane Company and a former EMT for the East End Ambulance Service. He was also a former Fire Chief for both Lincoln County Station #6 in Broughtontown and Station # 2 in Crab Orchard. Roger was a KHSAA referee for both high school football and basketball. He also was a referee for multiple little league and middle school games, including tee-ball and baseball. Roger enjoyed golfing, loved Nascar and mowing the yard. Memorial Contributions can be made to the Mt. Zion Church of Christ Cemetery fund. To send flowers or a remembrance gift to the family of Roger Brown, please visit our Tribute Store. "Email Address" would like to share the life celebration of Roger Brown. Click on the "link" to go to share a favorite memory or leave a condolence message for the family.